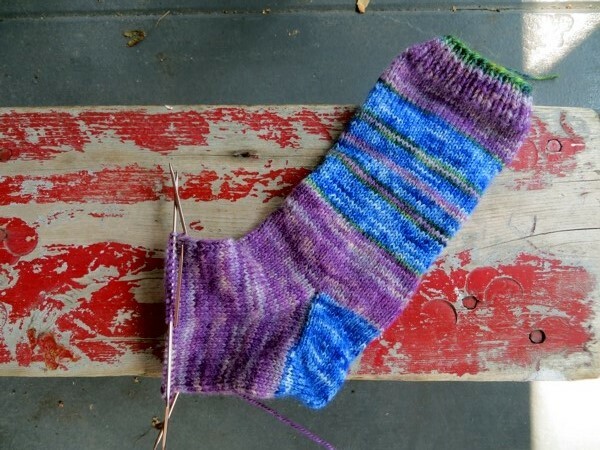 This post can do for Your Weekly Heartbreak, even though it starts out as a victory-over-yarn-substitution tale. 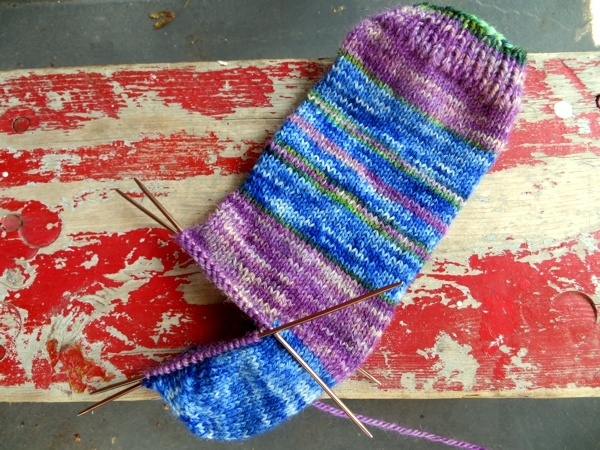 Remember our last Weekly Heartbreak, when I couldn't knit the socks I wanted because I'd gone off to the cottage with incompatible yarn weights? (isn't it nice to have first world problems?) 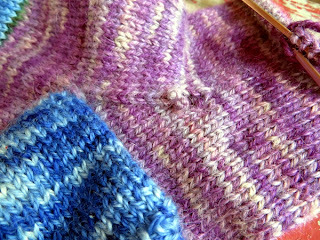 Well, I found some fabulous purple yarn in my stash that is only slightly heavier than the companion yarns I'd allocated for the next pair. And they look nice together, yay! 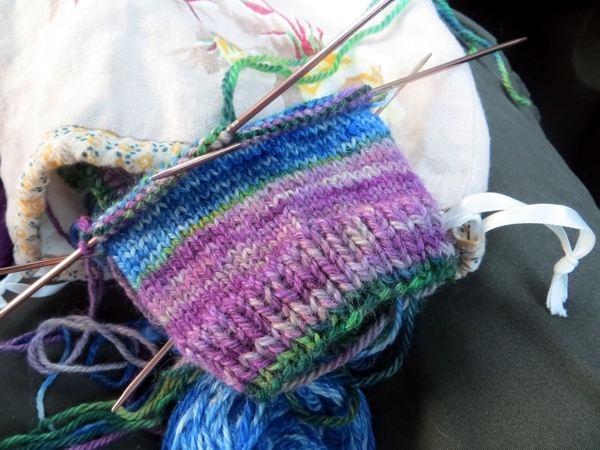 I started knitting these on my road trip to the Niagara region, which is jam packed (ha, Greaves jam reference) with history, and I couldn't help thinking how I was doing something those long-ago women did in this region that people still do today: make do and mend. Which is to say, make do with the materials at hand, and take time to prettify the work no matter how humble those materials might be. Not that these materials are humble in themselves... just in their quantity. 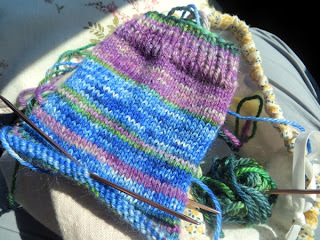 I was eking them out as I went along, trying to make a whole sock out of not enough of any one colour and making it look like it was done on purpose because green and blue and purple stripe so well. I think it works, don't you? 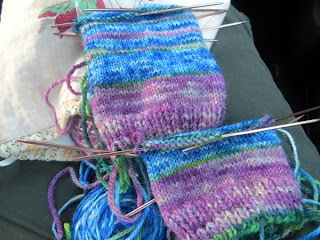 Fortunately there have been enough car trips since then to make serious headway on the socks, which is more Yay. ... some of the headway happened at night, after dark, in a moving car with enough erratic traffic around that me putting on a little knitting light was unwelcome. So when I got home, I discovered THIS. 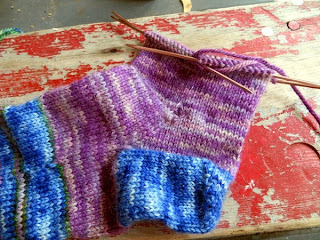 Not one but two dropped stitches, all the way back at the gusset! And I brought it on myself with that 'and mend' nonsense. 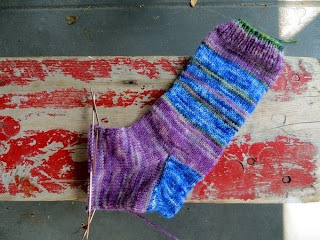 Couldn't I just have dubbed these the Make Do socks?? So now if you will excuse me, I need to go do some ripping out. I guess it's still better than the Basement Tidy, but not by much... and I still have to do more Basement Tidy today on top of the ripping. Have a good weekend, and send good sock thoughts my way, and I will see you again on Monday! which is a holiday here in Canada, because we need one obviously, heh. Sorry about the socks! Hope you get them back on track and have a happy Labor Day.